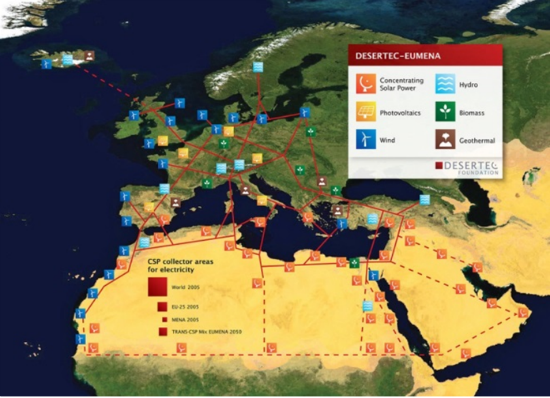 The DESERTEC Foundation has suggested that up to 20% of power demand in Europe can be obtained by connecting African deserts to European cities (Figure 1). The idea is to build a large number of concentrated solar power (CSP) plants in Middle Eastern and Northern African (MENA) countries, and to transmit electricity to Europe by means of very efficient high-voltage direct-current cables. CSP in deserts, as explained in greater detail below, has the potential to generate renewable electricity, predictably, for up to 15–16 hours per day, thus overcoming two major problems with photovoltaic and wind power: intermittency and few operation hours. A prominent Technology Roadmap of the International Energy Agency published in 2010 had very optimistic prospects for CSP, and projected a significant amount of electricity transmission from MENA countries to Europe – up to 15% of total electricity consumption in 2050 (see IEA 2010). Is it economically, technologically, and politically feasible to cover a large fraction of power demand in Europe from the MENA deserts? We answer these questions by relying on numerical scenarios generated using the integrated assessment model WITCH to study when, how much, and where it is optimal to invest in CSP, and what the potential size of an EU–MENA power market is (Massetti and Ricci 2013). We find that it is premature for Europe to invest now in large CSP projects. There is scope for pilot projects, but large economic benefits from trans-Mediterranean CSP trade emerge only from 2050 onward. However, the threats to European energy security from extensive trade in electricity with MENA countries should not be underestimated. Europe is setting increasingly strict greenhouse gas emission-reduction targets, with the intent to lead the world in the fight against climate change.2 If Europe truly aims at a achieving the heralded +2°C temperature limit, more stringent targets will follow because aggregate emissions must basically drop to zero. With uncertain prospects in Europe for both nuclear power and fossil-fuel power plants with carbon capture and storage, renewables will likely play a major role in the future technology mix. The problem with renewables like wind and photovoltaic is that they are intermittent – winds are erratic and the sun does not shine at night. A power system that relies on wind and photovoltaic for the bulk of its generation capacity must be upgraded with new transmission and distribution grids, with storage capacity and with backup capacity. This is expensive and thus penalises renewable technologies compared to coal or natural gas thermoelectric power plants (EPRI 2011 and IEA 2014). The ideal technology should provide steady, adjustable, and predictable power from totally renewable sources. CSP generation is very close to this optimum. The idea is extremely simple and as old as Archimedes’ mirrors during the Siege of Syracuse – reflecting surfaces are used to concentrate direct sunlight in a narrow area to heat a fluid. The fluid is collected and used to transform water into steam, which is then used to rotate a turbine as in any thermoelectric power plant. Direct sunlight substitutes coal and gas. The temperature reached by the fluids during the day is so high that it is possible to store heat for most of the night and generate an almost continuous stream of power. A natural gas turbine may complement the system to guarantee 24-hour power generation. The major drawback of CSP is that it needs virtually cloud-free sky (unlike photovoltaic, which works well even under cloudy skies). The best sites for CSP are deserts because the lack of humidity largely reduces average cloud coverage. Deserts also offer large inexpensive areas of land to host large expanses of mirrors. The problem is that deserts are usually not close to where people live and work. The idea is then to use new generation transmission cables that have minimal power losses to connect deserts to cities. With a few exceptions in Spain and in Southern Italy, Europe lacks the best climatic and geographic conditions for CSP. A large-scale development of CSP is not possible in Europe. However, many of the states on the Southern Mediterranean shore have an abundance of deserts with ideal climatic conditions – hence the plan to build a network of cables up to central and northern Europe. CSP is a proven technology that can work at large scale. The leading country is Spain, with 2300 MW of installed capacity, followed by the US where 4 plants became operational in the last 10 months, reaching 1435 MW of total installed capacity. More plants are to come in 2014 and the following years in the US, China, India, South Africa, and other countries in the Middle East and Northern Africa (Figure 2). Is CSP economically attractive? At present, CSP power generation is four or five times more expensive than fossil power generation (see IPCC 2011). 98% of the investment in CSP so far has needed public support (Stadelmann et al. 2014). But how would the incentives to invest change if carbon emissions start being penalised and learning-by-doing contributes to reduce the investment and operation costs of CSP? Will a ‘climate-friendly’ investment environment incentivise large investments in CSP, and will it become attractive for Europe to import CSP from the deserts of Africa and of the Middle East? We find that it will be economically efficient to invest in the large-scale deployment of CSP only after 2050. In the first half of the century there are other, less expensive options to reduce greenhouse gas emissions. With limits to nuclear and/or to fossil-fuel power plants with carbon capture and storage, large investments start instead in the first half of the century. Quite interestingly, investing in CSP becomes attractive also without climate policy in regions that have high domestic production potential. Thus, a strong climate policy signal in line with the declared targets would make CSP economically very attractive and would create the incentive to build a large trans-Mediterranean power network. Thus, according to our analysis, DESERTEC-like projects seem premature but economically sound – if the right policies are in place. Is it however conceivable, from a geo-political point of view, that Europe will rely on MENA countries to cover a large share of its electricity demand? First, if the market will be dominated by a small group of large (state) operators there is a concrete risk of rent-seeking behaviour. With our model we show that MENA regions have the incentive to form a cartel to supply electricity at a price above the marginal cost. Devising institutions that are able to increase market competition appears an enormously complicated task in the present geo-political conditions, but it is not impossible. Second, and most importantly, a large trans-Mediterranean power market has the potential to increase the energy dependency of Europe. It is important to keep in mind that demand and supply must be constantly balanced in order to guarantee the correct functioning of power systems. A sudden large imbalance typically causes a blackout. This means that an unexpected drop in power generation from the MENA regions would put the whole European network under the risk of a blackout. It seems that the main limits to transfer electricity from the deserts to Europe in the long term is thus not technological nor even economic. It is rather a series of geo-political considerations that suggest caution. These problems can be worked out, especially over very long time horizons. Under the current state of international affairs, CSP seems to have only a marginal role in the future of Europe. This is a limiting factor towards a fully de-carbonised economy compared to the US and China because both countries have very large domestic CSP generation potential. Electric Power Research Institute (EPRI) (2011), “Estimating the Costs and Benefits of the Smart Grid: A Preliminary Estimate of the Investment Requirements and the Resultant Benefits of a Fully Functioning Smart Grid”, Palo Alto, CA, 25 May. European Commission (2014), “A policy framework for climate and energy in the period from 2020 to 2030”. International Energy Agency (IEA) (2010), “Technology Roadmap: Concentrating Solar Power”. International Energy Agency (IEA) (2014), “Technology Roadmap: Energy Storage”. Intergovernmental Panel on Climate Change (IPCC) (2011), Special Report on Renewable Energy Sources and Climate Change Mitigation, Cambridge University Press. Massetti, E and E C Ricci (2013), “An Assessment of the Optimal Size and Timing of Investments in Concentrated Solar Power”, Energy Economics, 38: 186–203. Stadelmann M, G Frisari, R Boyd, and J Faes (2014), “The Role of Public Finance in CSP: Background and Approach to Measure its Effectiveness”, Venice: Climate Policy Initiative. 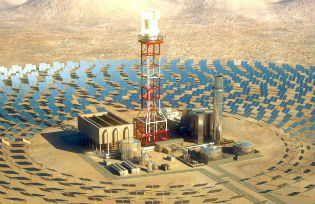 1 For example, Professor Jeffrey D Sachs is optimistic about the possibility of generating solar power in the deserts of the world (see for example http://bigthink.com/videos/jeffrey-sachs-on-the-power-of-solar-energy). 2 By 2030 the EU28 states, as a whole, are committed to reduce emissions by 40% below the 1990 level, to increase energy efficiency (by a level to be defined later this year), and to increase the share of renewables to at least 27% of total energy demand (European Commission 2014). 3 Global greenhouse gas concentrations are capped at 535 ppm CO2-equivalent in 2100. The policy tool that we use is a global emissions trading scheme, with a unique global carbon price. 4 We assume that CSP has the characteristics to directly substitute coal and natural gas power plants.